What do you desire after a long day of travel? For many, especially those on long road journeys, a decent meal and comfortable bed are high on the priority list. With this in mind, a Tennessee man named Dan Evins decided to open a cozy restaurant in the small town of Lebanon, Tennessee. Although the town is tiny, it sits off of I-40, a large interstate that runs between the big cities of Nashville and Knoxville. The idea was to create an environment where people could eat a good, cheap meal and be reminded of home and childhood delights in the process. 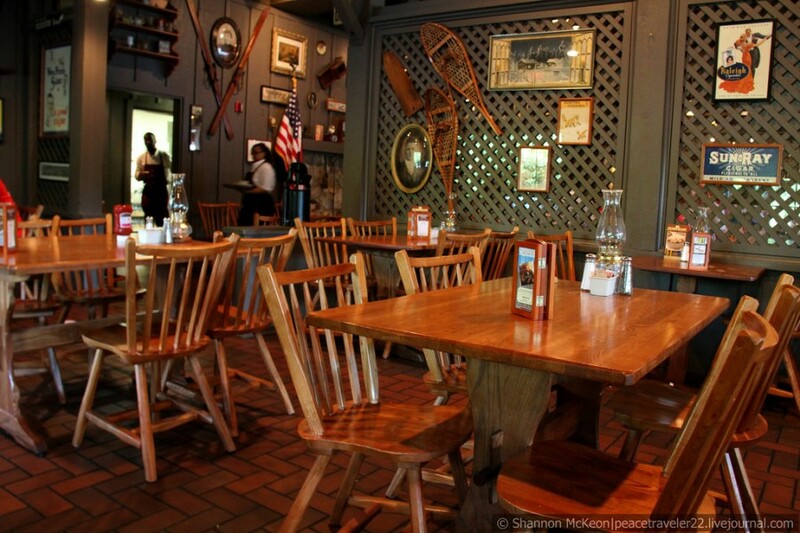 In 1969, his imaginary restaurant came to fruition and the first "Cracker Barrel" opened in America. 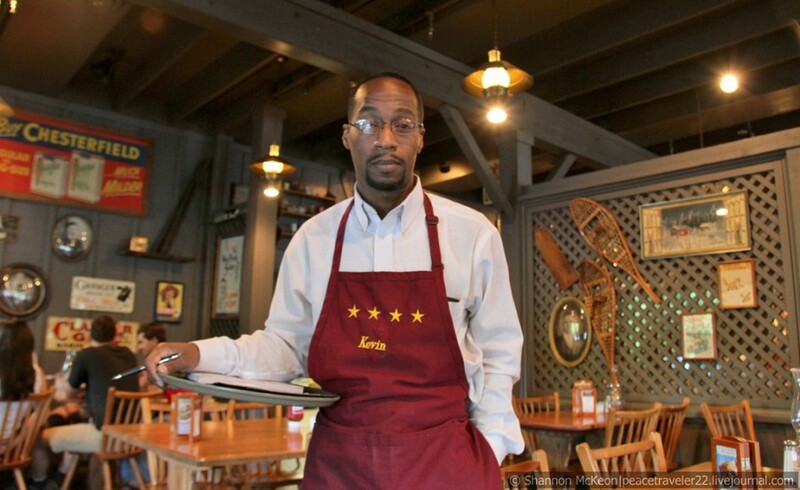 Mr. Evins a living embodiment of the American dream - work hard, produce quality products and reap rewards. Today, the chain has over 600 locations in 42 States, mostly located off of main roads or highways. This is one of my favorite places for dinner, where you're always greeted with friendly Southern hospitality no matter where you are in the country. Let's take a closer look inside. 1. The theme of the restaurant is a country store, filled with treats and other items that make you feel good when you're far away from home. As a kid, I remember going to my local store and buying small candies for a few cents. Great pleasure, cheap price! 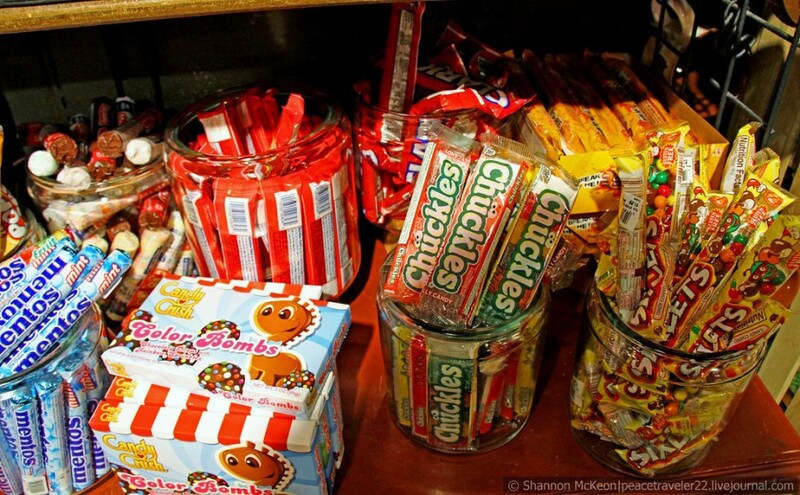 At all Cracker Barrels, you can choose from a wide-variety of sweets. I always pick up a few of these flavored sticks on my way out. Easy to carry and transport if you're driving long distances. 2. 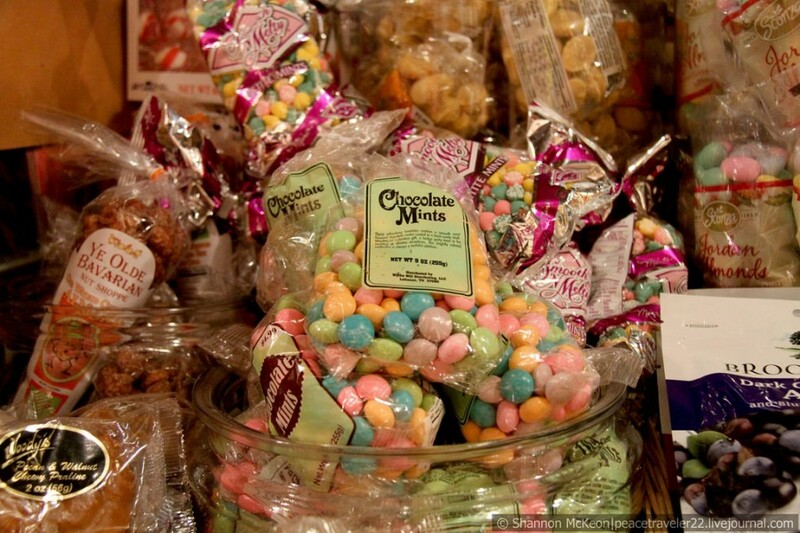 Vintage sweets. The restaurant also carries old-fashioned sodas, in vintage glass bottles. 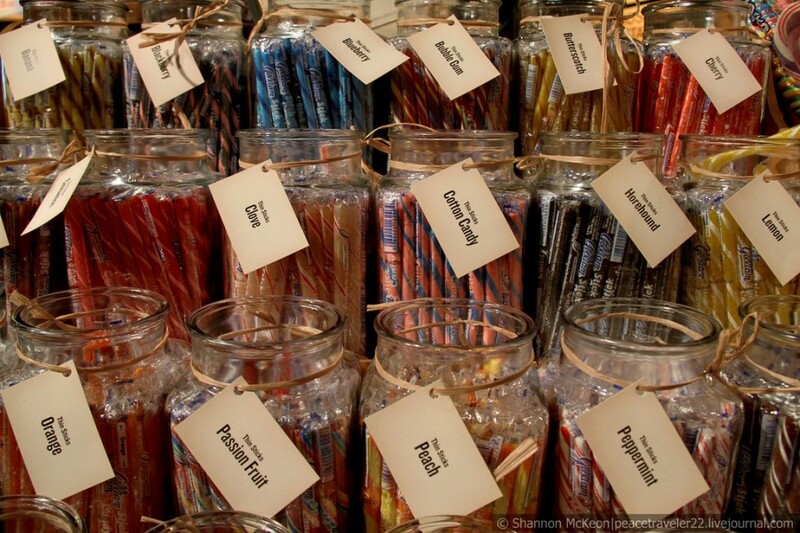 You can pick from orange soda, root beer, grape and other classic flavors. 3. 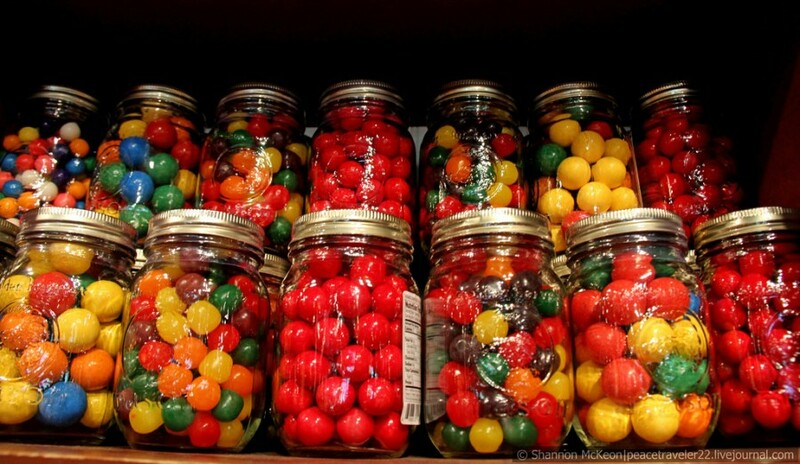 Gumballs, jaw breakers and atomic red fireballs, all packaged in Mason jars. 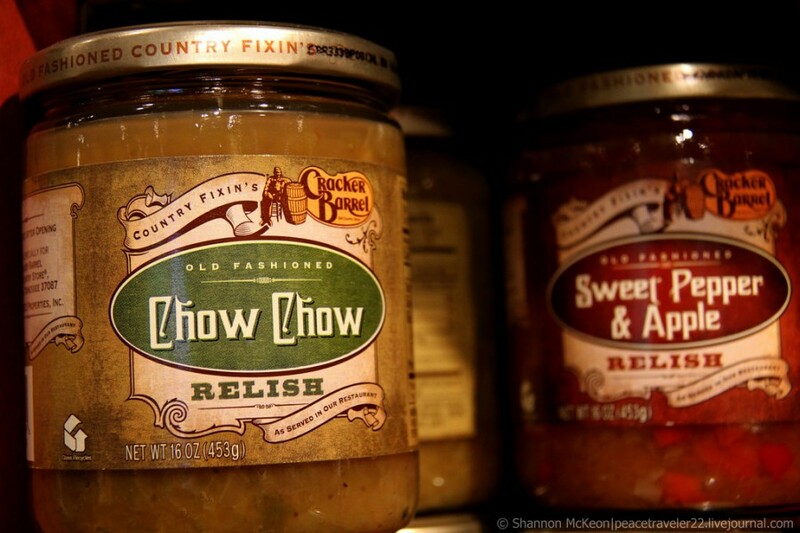 All over the world, people use similar jars for pickling vegetables. Btw, these atomic fireballs are cinnamon flavored and very hot! Sometimes it's impossible to keep the candy in my mouth for longer than a few seconds. 4. 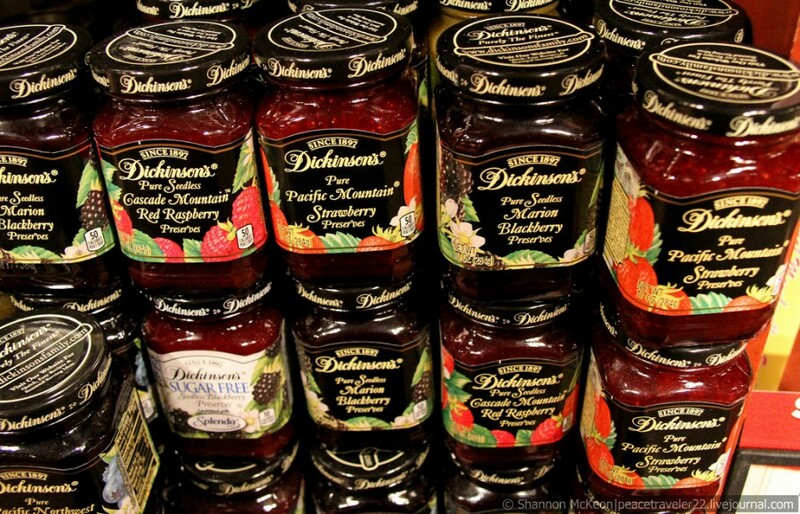 Yummy jams! These make nice gifts around the holidays. 7. 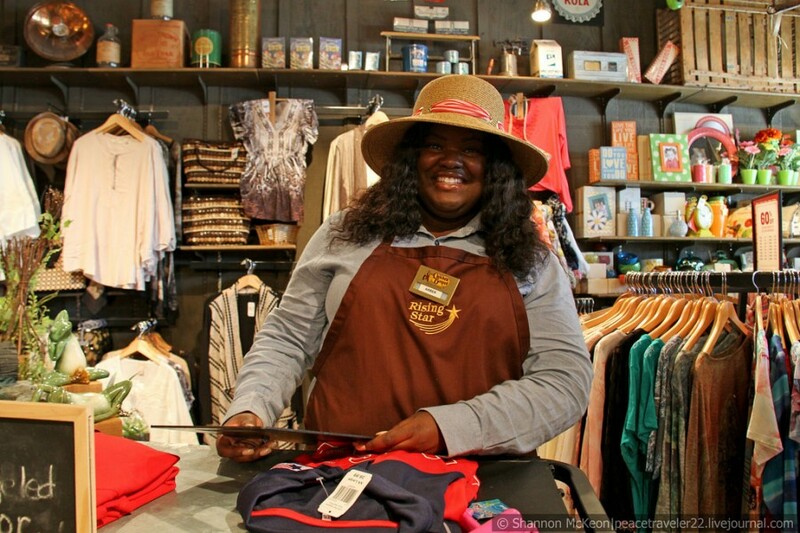 The country store also offers a small selection of clothing and toys. 8. 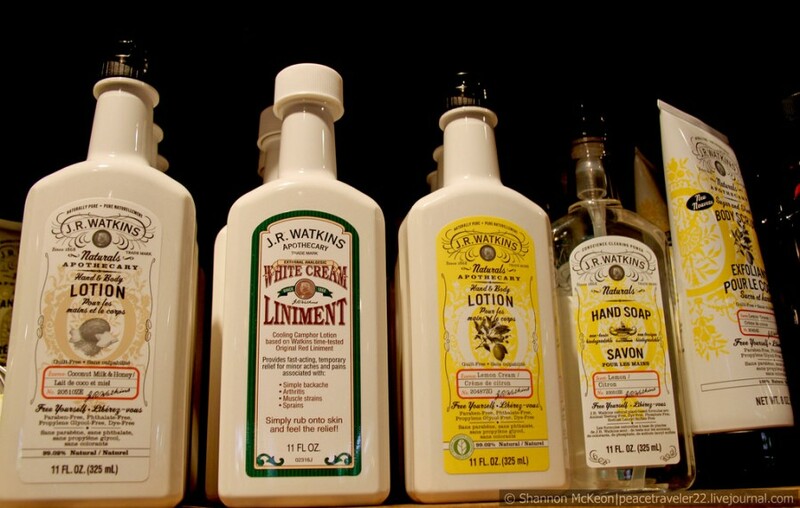 Hand creams, ointments, and other lotions which can come in handy for a traveler on a long car journey. 9. 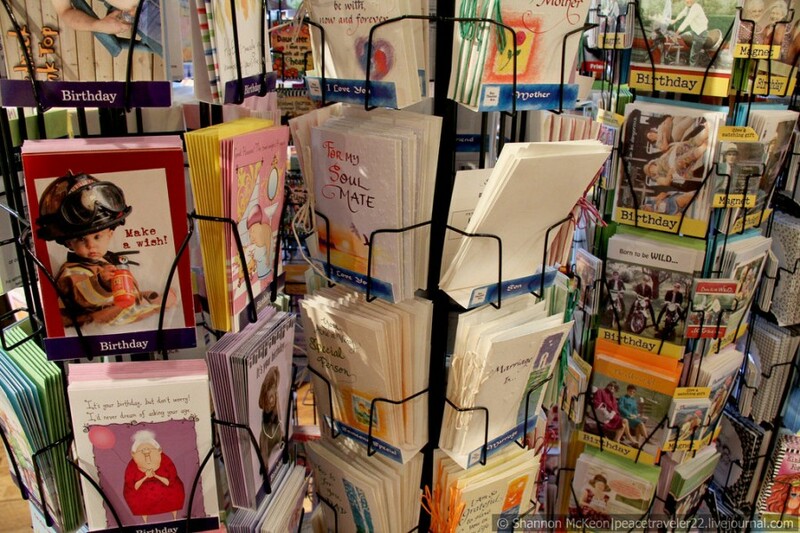 Pick up a birthday or friendship card and mail it to a loved one in your home country! The store also has post cards and a lot of unique local items which make good souvenirs. You can rent audio books to listen to on long car rides, and return at another restaurant location. A large selection of country music also is available. 10. 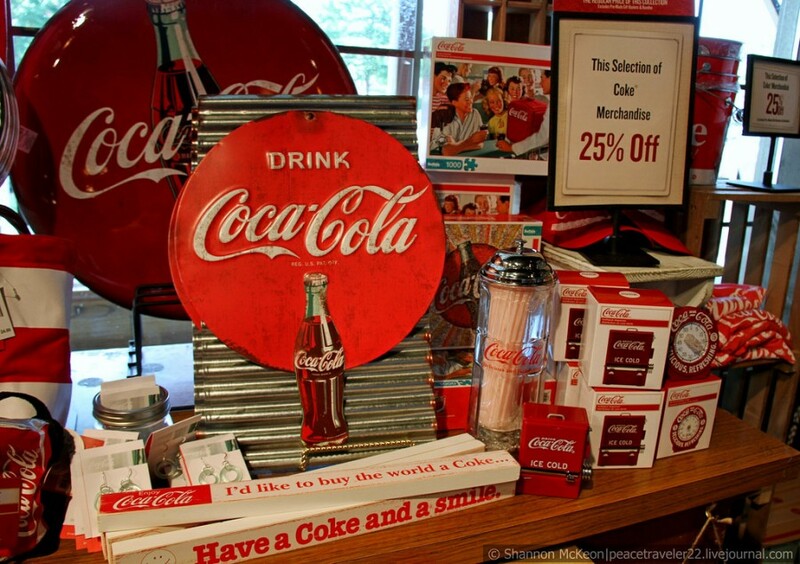 Coca-Cola - the most recognized trademark in the world! The store offers merchandise branded with older advertising themes. 11. 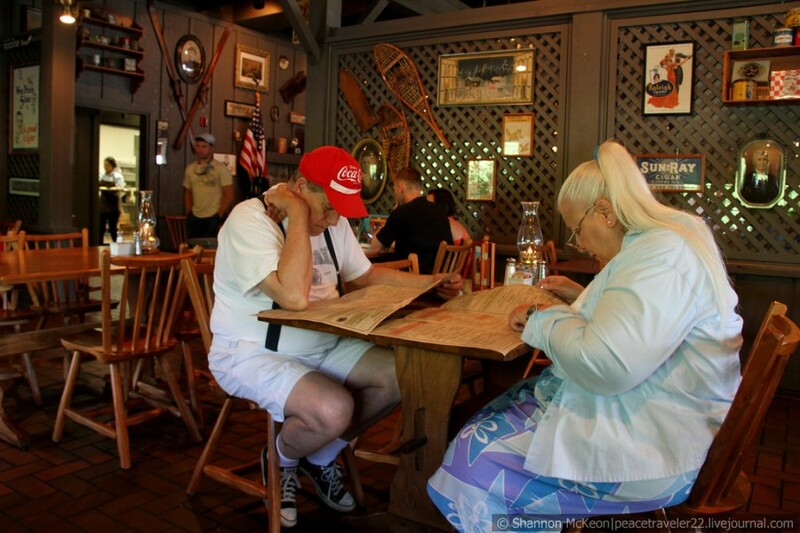 Cracker Barrel is a very popular restaurant in the States, and sometimes there are long waits for tables. 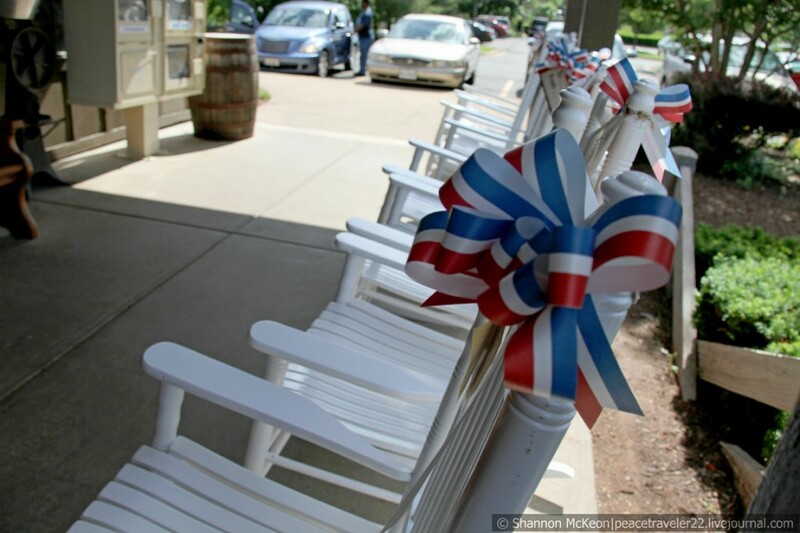 However, all the locations have huge, wrap-around porches with these rockers for guests to sit in and buy. They're high quality and expensive, I think about $150 USD. But comfortable to rest for a few minutes before you're seated for the meal. Reminiscent of a summer cabin or dacha, with the big porch and rocking chairs. 12. 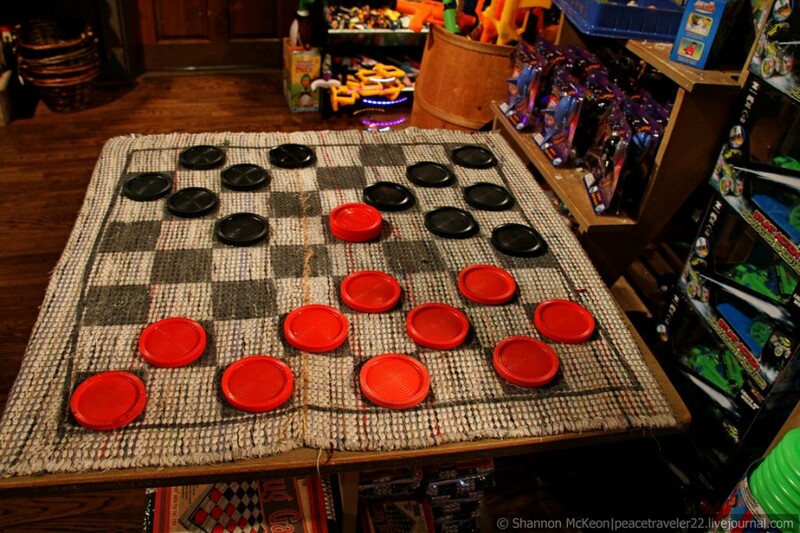 If you don't want to walk through the country store, or lounge on the rockers, you can play a game of checkers to pass the time before seating. 13. Now, on to the food! Every day, the restaurant offers a daily special. 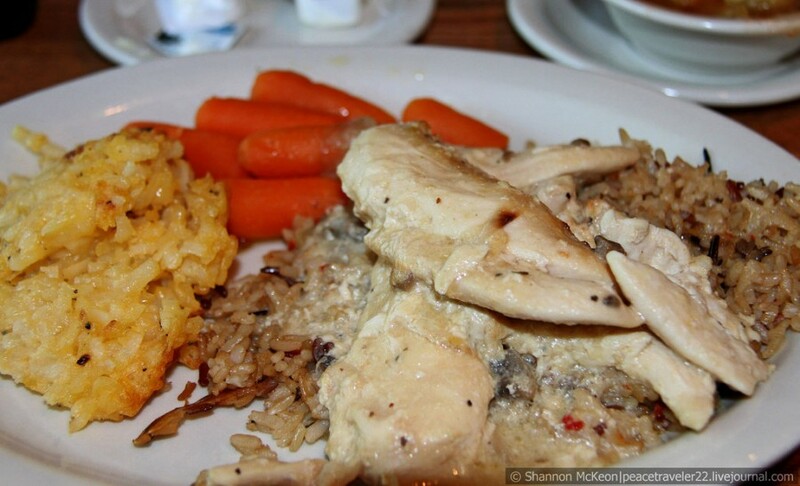 On Saturdays, it's always "chicken and rice." This is what I ordered. 14. Inside decor. Each location is different, but the walls always contain vintage framed photos of various scenes from America. Antique photos of random people, farm scenes, advertising through the decades, etc. Consistent with the theme of creating the experience of a "home away from home." I like the old portraits of strangers the best. My mom has similar photos of her great grandparents hanging in her bedroom. 15. Our waiter, Kevin. The name of all the servers and workers are sewn into the uniform. 16. 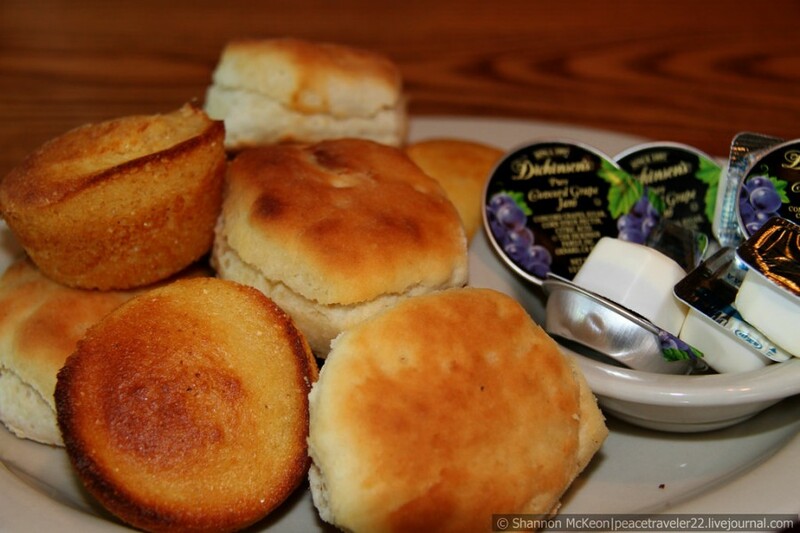 All guests are given complimentary biscuits, cornbread and jam before the meal. Common in American restaurants to get something free before a meal. Italian restaurants usually serve complimentary garlic bread, other restaurants give you some type of rolls or bread, and pubs often serve home-made soft pretzels w/mustard dipping sauce. I remember in Prague, the waiter brought bread to our table and when checking the bill I noticed a charge for it, and asked that it be removed. Poor customer service to bring something to the table w/out asking, and then add it on to the customer's bill. 17. Dinner and lunch menu. A variety of meats and fish, all served with your choice of two or three vegetables. It's difficult to read because of the sunlight glare in the photo, but prices range from $6 - $10 USD. 18. I ate the Saturday special "chicken and rice." Very good! Slow roasted, white meat chicken breast covered in gravy and served over long grain rice. Really tender, rich and flavorful. For side items, I picked carrots and hashbrown casserole. The casserole is shredded potatoes mixed with a variety of cheeses and onions. Good, but decadent and not the healthiest option on the menu. 19. Dad's meal - "chicken fried chicken." 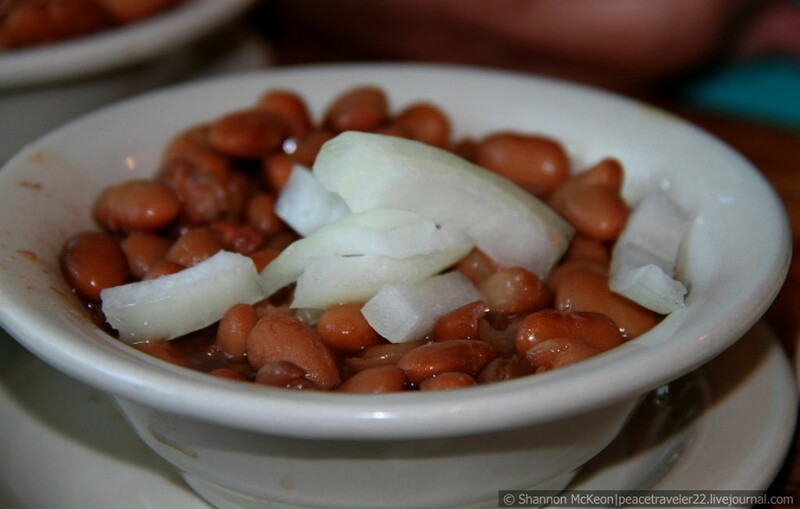 Common American dish in Southern style restaurants. 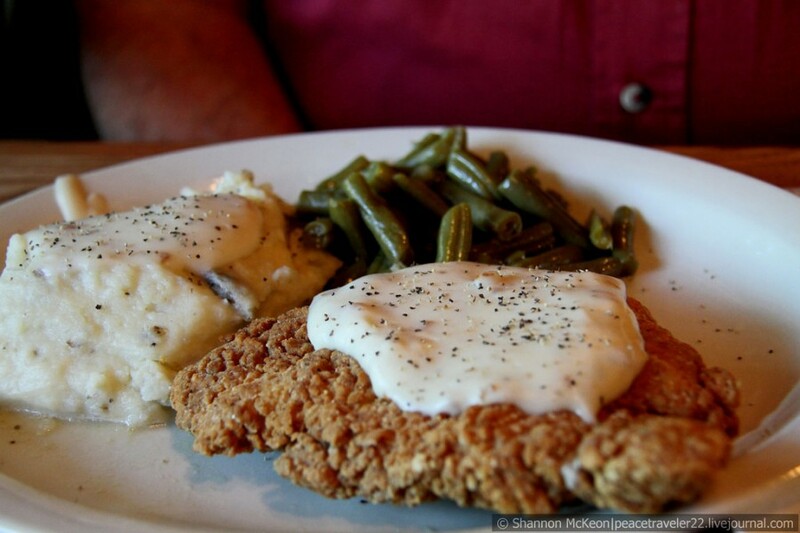 Basically a fried chicken breast covered in white pepper gravy. His side options are obvious - mashed potatoes and green beans. 20. Sometimes readers make comments to me about Americans stuffing their faces with McDonald's and hamburgers every day. I don't know if it's a joke, or if foreigners really believe this is what most Americans eat every day, but it's not true for me, my family, or any of my friends. It's easy to pick healthy options in almost all American restaurants, even McDonald's, if you're disciplined enough. My sister usually orders soup and salad at Cracker Barrel. Salad is covered with fresh vegetables, and light soup offerings like minestrone or other non-creamy soups are healthy alternatives to the richer, calorie filled meals. 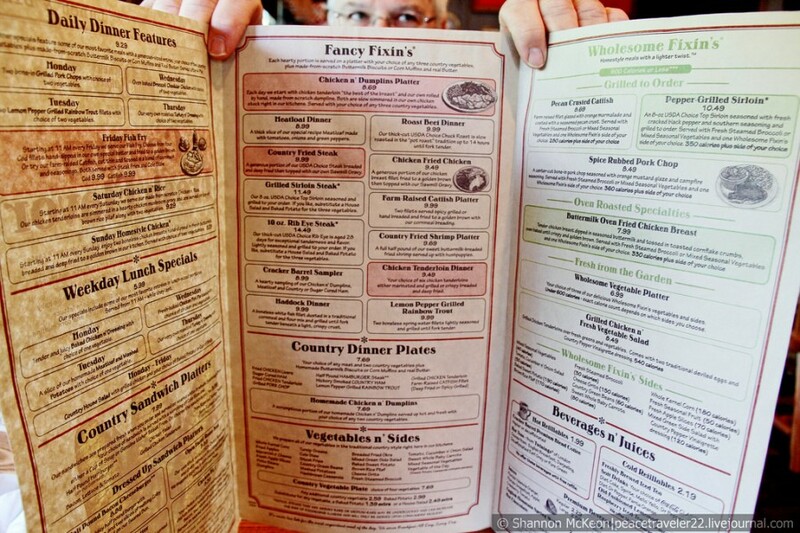 As you can see on the above photo of the menu, there's also a whole side dedicated to "Wholesome Fixins" for the health conscious. The only convenience of McDonald's or other fast food joints is the quick service. In recent years, fast food prices have increased to the point that it's not much cheaper to eat at those places. For $1 - $3 dollars more you can have a proper and tastier meal at a place like Cracker Barrel. 21. My mom always gets the vegetable plate, four choices from a big list of items for only $7.69 USD. She always picks pinto beans w/onions as one of the vegetables. This is a mushy red bean, commonly used in meat stews in America. 22. 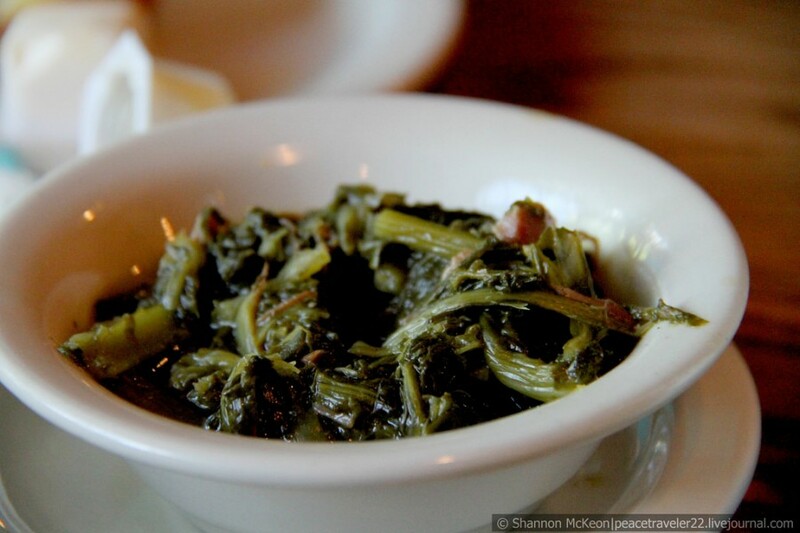 Green, leafy vegetable called "kale," served with small chunks of ham for flavoring. Similar to spinach. 24. 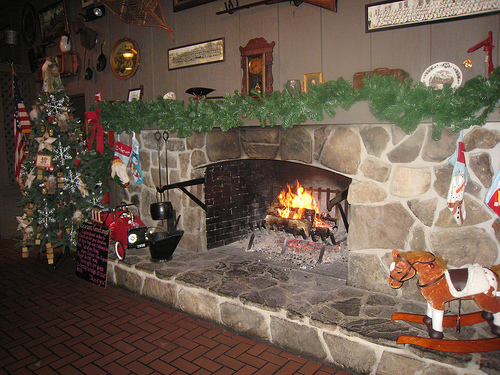 All the Cracker Barrel locations I've visited in various States have real, wood burning fireplaces. It's great at Christmas time to have meals by the fireplace, with stockings and other festive decorations. 25. Although no restaurant can truly recreate the feelings or tastes of home, this one does a pretty good job. 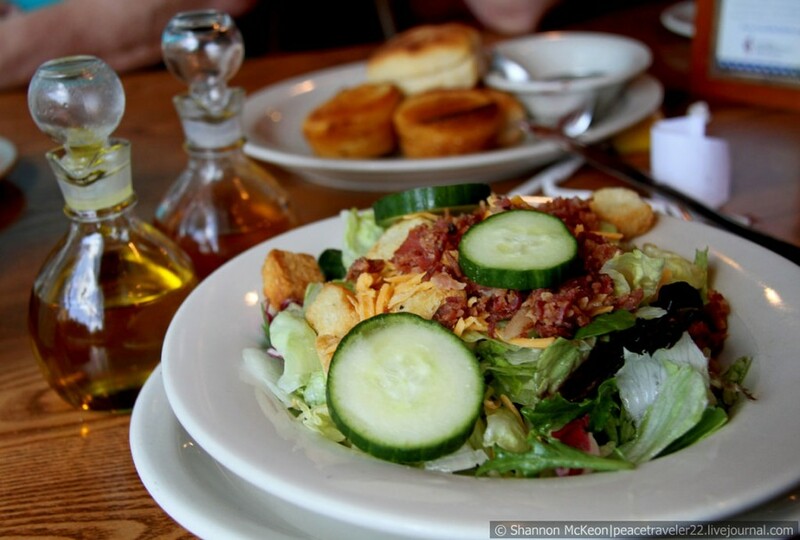 The food is affordable and good, the atmosphere is cozy, and there are plenty of things to look at if you visit during a crowded time and have to wait for a table. 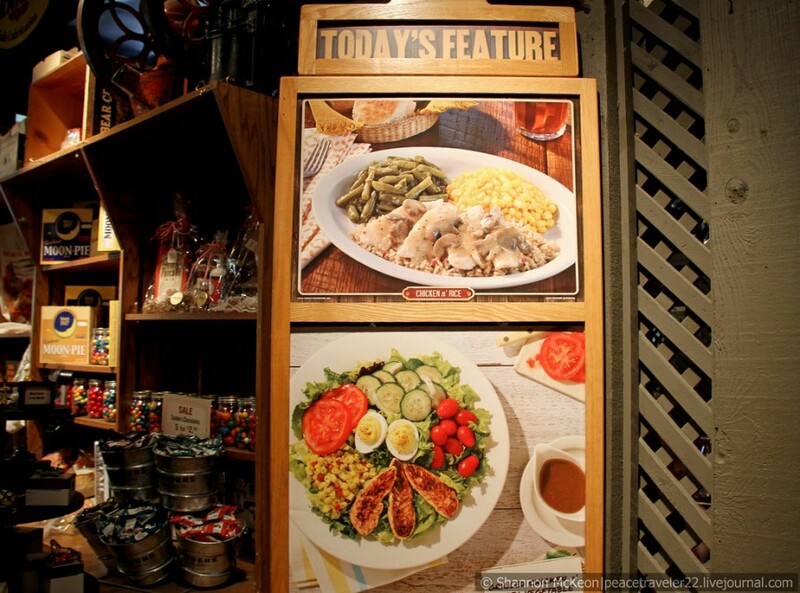 Look for advertising billboards for Cracker Barrel on your next American road trip, and be sure to stop for a meals. Even if you don't like the food, I think most of you will enjoy the theme and environment of the restaurant. So good story. Unfortunately the food isn't the one thing I'm too much interested into. It's my last food story for awhile. :) Next week, I'll start my reports from Israel. I've been sick and busy with work the past few weeks, so I've had no time for the blog. Pity! Very nice place, very nice food and very nice prices. I like them all. Here in UK we haven't got many so spacious eating places, our pubs are usually small and look traditional, old fashion way. Only fast food restaurants probably are the same all over the Globe. But here we struggling to find a nice food sometimes, because pabs almost everywhere are serving just drinks/ I don't like this, I prefer Lithuanian way, where you never get any drinks without appetizer and snacks. Yes, I remember in many places in Europe the pubs only serve drinks or light appetizers. At most American pubs and bars you can order full meals. I guess we really like to eat here. :) In general, I'm not so keen on the UK style of eating, with those beans served at almost every meal. I find the food there to be quite bland, and in places like London, so expensive!! I'm sure it's much cheaper in villages and rural places. Cool place, and they are everywhere! Especially in Southern States. 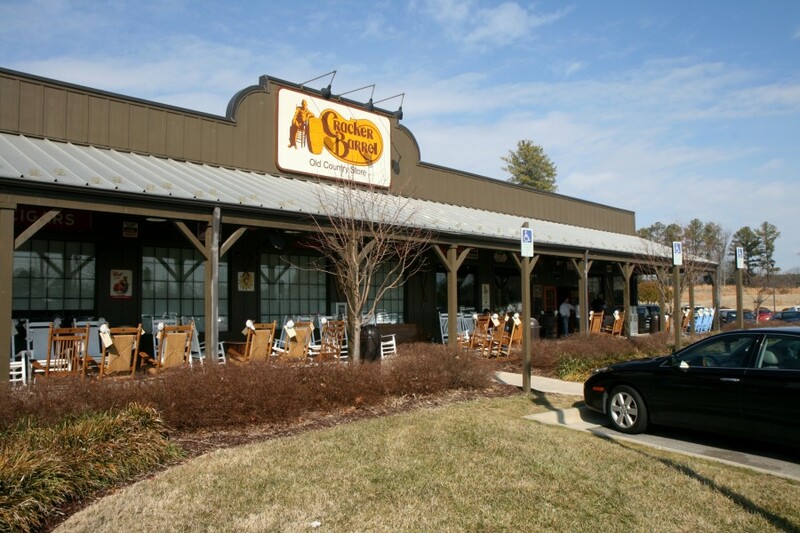 It seems there's a Cracker Barrel at almost every highway exit. I usually eat at the one in my hometown of Manassas, Virginia. It's only five minutes from my parents house. You ate there? How do you know about the little bottles of maple syrup? I didn't photograph them. 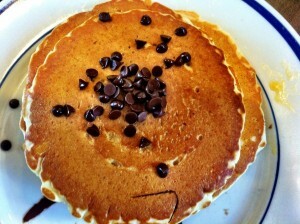 :) My dad loves those, and always asks for extra bottles when he orders pancakes or French toast. Very Americana! I didn't notice too many chain restaurants in Russia, although I saw a lot of T.G.I.F. 's, which surprised me. Awesome place, food looks really delicious! 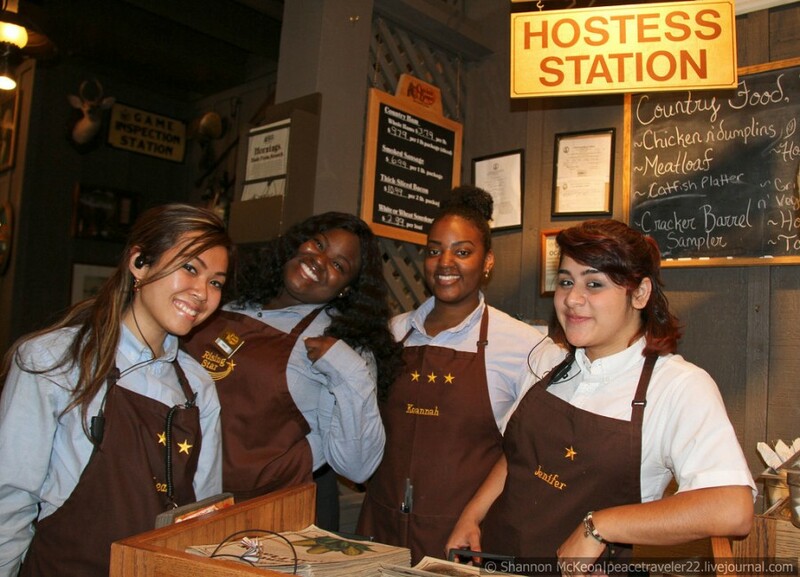 These black waitresses are friendlier and harder working than almost every Russian server I encountered. So, I have absolutely nothing bad to say about them. You tasted the food during one of your American journeys? Or, you're just judging the quality based on my amazing photos of the food? :)) You will not visit the U.S. this summer? Thanks, good to know what it is. There is one in my area, but pretty far away. May be, one day after skiing there we will stop by.